I started using CAD products when they were still running on a DOS platform; I spent many years using expensive programs, but still struggled to find a good way to present in 3D for my clients. I started using Sketchup Pro as a solution for presentations, and used the DWG exporters to continue the drawings in CAD. I quickly realized that LayOut would allow me to completely eliminate my CAD program—I could create construction documents directly from the presentation model. 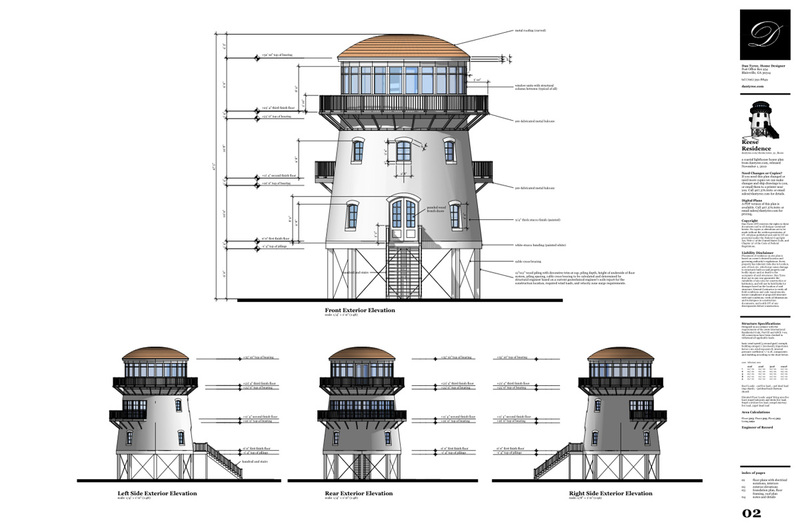 We use Sketchup and LayOut to create amazing presentations for our clients. We are able to show the design in rendered views or immersive videos. Clients are able to picture what the final product will be in vivid detail. We provide the SketchUp file to clients so they can experiment with colors, or just browse through their new home design. We post images and videos of the design on the client's page (on our website) for their review. 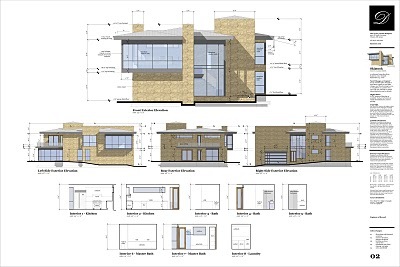 LayOut provides everything we need to create construction documents. Next, we take the SketchUp model and link it to a LayOut document in order to start developing the construction drawings. These drawings include full-color renderings and perspective views, as well as traditional black and white parallel projections. The interaction between the two products allows us to offer changes throughout the process, even right up to the moment of final printing. PDF and CAD files are exported from LayOut. These are made available for our clients to download from our website. SketchUp and LayOut have made presenting a design and creating construction drawings a streamlined process, and have allowed us to provide an affordable custom design product. Thank you for sharing your work with us, Dan. These documents look fantastic! Supremely crisp and clear architectural plans and elevations. I am an English architect. These illustrations prove the communicative power of this immensely versatile software - SketchUp. Are you using any CAD software in your workflow? I also use SU8 Pro, but have been using Softplan since V8(DOS Version). Currently I use SP V14, but have held back on paying the $800 upgrade fee for SP 2012 as I have been toying with the idea of going completely over to SU & Layout. I find floor plans are quicker in SP, but that may just be my technique. Nice work and web site. I find your presentation to be superior to any other web site I have visited. I don't use any products other than Sketchup and Layout. I eliminated AutoCAD completely about a year ago. Thanks for the compliments on my website. God bless. I think Layout is a great tool, yet i still find it quite slow. Is there something I have been missing? I wish i could get rid of all the cad programs and use only SU and Layout just like you did. Great work and great website, congratulations. When I first started using Layout instead of AutoCAD, it was a bit slow. I was trying to use the same techniques to duplicate my workflow in AutoCAD. I had to "clean off my desk", so to speak, and learn how Layout works best, and use those tools. Keep working with it, and I think you will be pleasantly surprised. I setup 2 styles in Sketchup for my models. One is full color with textures, and the other is black/white. Then in Layout, I render the floor plan views with the black/white version in vector mode, and the elevations in full color in hybrid mode. This helps speed up the rendering time on each page. Thanks Dan. Very useful tip. What sheet size are you using- are you only using tabloid? Is there a way to use a 24" x 36" sheet in Layout? Absolutely stunning work! Also, your website is so smooth, uncluttered and extremely appealing. I am a residential remodeler and I've been using SU Pro to design and illustrate projects to clients before we begin demo. It's helped tremendously in avoiding needless change orders and as a sales tool. Similar to Fguerra's comment, when I am working in SU, even in a kitchen remodel, the program starts to slow down and when that sketch transfers to Layout, it slows down even more. Are you using a special video card? Processor? Anything like that? Also, the short videos on your site are beautiful. Any suggestions on how to create them? Dan, your work with SU Pro confirms my choice as well. I am a house designer in Portland, OR. I too, have made the complete switch to SU Pro and Layout for design and documentation, including very detailed interior documentation. It took some dicipline to ramp up my speed, but my clients and builders love it and I would never go back to ACAD! Most of my layout documents are on 36x24 sheets. In layout, select File>Document Setup, and then adjust the paper size. 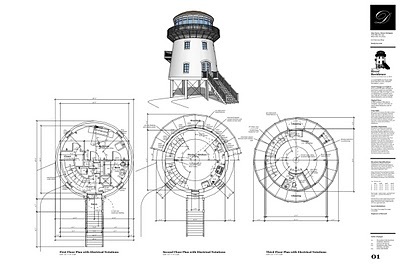 It's great to see other people using Layout for construction documents. I use it for smaller drawings and the like, but Layout's lack of adaptability in the look of the dimension tools and slow rendering of large drawings makes it extremely laborious in large documents, so I continue to use CAD for those. Thanks for the compliments. I'm not using any special graphics cards, etc. I actually am using a MacBook Pro 17" that is about 4 years old. :-). To keep your model 'light' and 'fast', I would avoid using round objects, and other high-polygon-count objects. You can also select Window>Model Info>Statistics and then purge the unused objects in your model. Be careful with this, because it gets rid of everything you aren't currently using, including custom materials. I create videos by setting up different scenes and then exporting a Quicktime movie. I have to study AutoCAD these days,because CAD is a required subject in my academy.I am not clear that some softwares can instead of CAD.I have been using SU almost two years but I ignored Layout.Anyway,this is where I am now,I might consider looking at others software. you work is exempelary and iconic. I wonder how you create the pencil effect elevations that work so well?